My friend Patricia gives me this tarantula hawk for my insect anatomy series. She finds it dead inside her home. I learn it’s the official state insect of New Mexico. After what I read about the wasp I wonder why the Land of Enchantment would adopt such a creäture. Ironically there are a few animals that will eat a tarantula hawk wasp – the road runner, New Mexico’s state bird, is one of them. 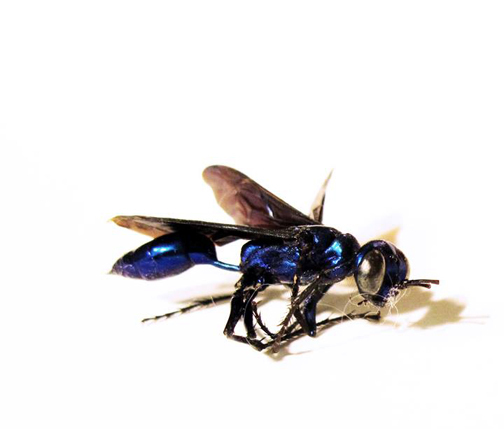 The tarantula hawk is a spider wasp with a metallic blue body and rust colored wings. This one here has large, silvery graphite eyes (very New Mexico if you ask me). The striking appearance is aposematism or warning coloration that benefits predator and prey – the wasp has a most painful sting. Despite these qualities it is relatively docile and attacks only when provoked. The female wasp hunts tarantulas. When she captures one, she paralyzes and drags it to her nest where she lays a single egg in the spider’s abdomen. The larvae will feed on the live tarantula until it emerges as an adult to continue the life cycle. The day Patricia gave me this bug, my husband saw one while on his bike ride in the Phoenix dessert. By his description, which included a newly caught tarantula, I knew what it was immediately. It lives in warm climates and here in the US is mostly found across the Southwest. 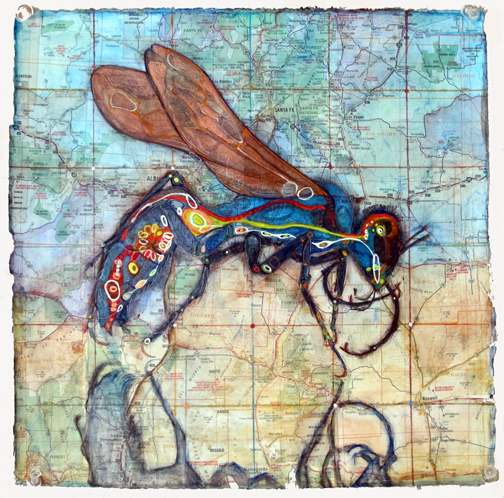 This entry was posted in anatomy, art and tagged art, collage, land of enchantment, new mexico, tarantula, tarantula hawk, tarantula hawk wasp, wasp by monica. Bookmark the permalink.